Can Europeans get Americans interested in American racing? Over the years, die-hard fans of flat-track racing have tried every means possible to boost interest in a quintessentially American but gradually dwindling form of motorcycle racing. Now, one of motorcycle racing's elder promoters is trying something totally new: Copy Europe, complete with the Spanish name. This year, the final race of the AMA Pro Flat Track series will take place Nov. 19 in Las Vegas. The next day, Vegas will host the Superprestigio of the Americas, a short-track race that — if all goes to plan — will include racers from other disciplines lining up against the flat-track stars. This is all a copy of the Superprestigio, an event that has drawn a lot of attention the last two years in Barcelona, largely propelled by the enthusiasm and fame of MotoGP champ Marc Márquez, an enthusiastic fan of flat-track racing as part of his training. 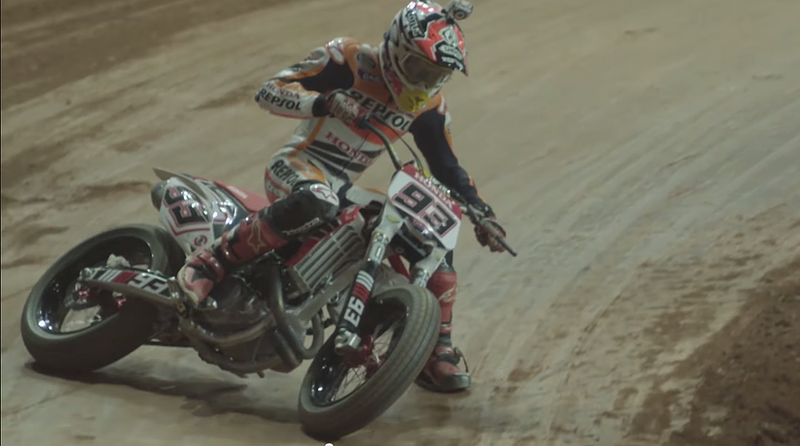 In the first version, Márquez clashed with AMA Flat Track champ Brad "the Bullet" Baker in a memorable finale, with Márquez crashing, but smiling all the while and clearly having a great time. Márquez won the second version, edging top U.S. rider Jared Mees. Can a little of the European glow rub off on the U.S. series, the original one that the Europeans had never even thought of until Kenny Roberts came over in 1978 and showed that sliding a GP bike can be a good thing? The Superprestigio of the Americas has a few things going for it. It is being promoted by Steve McLaughlin, who helped invent the Superbike class of roadracing and went on to help create the World Superbike series. Vegas is probably the best location, and by following the season finale, there will be plenty of talent on hand. But... I have my doubts. The Superprestigio has been a success (more in terms of media attention than actual butts in seats — the Palau Sant Jordi has yet to sell out) largely on the strength of Márquez's enthusiasm and fame. The Superprestigio in December had Márquez, Bradley Smith and Scott Redding from MotoGP. It had three top U.S. flat-track racers, including Shayna Texter, to add the twist of a female participating. Former World Superbike champ Troy Bayliss came out of retirement to ride. Still, there were empty seats. What stars can we expect to see in Vegas? Certainly not anyone with the candlepower of Márquez. While roadracers love flat-track for training, do any Supercross racers ever train via flat-track? Maybe someone like Colin Edwards could come out of retirement. Best-case scenario, Edwards and Nicky Hayden, another former flat-tracker, would line up. Would that be enough to drum up the kind of interest flat-track needs to spark a revival? Those die-hard fans keep telling us how great flat-track racing is, how close, how exciting and handlebar-to-handlebar it is, but logical arguments don't sell race tickets. To the younger demographic, it just looks old. The tracks look old, the bikes look old, and they just keep turning left, instead of flying 30 feet in the air with flames shooting into the sky, like Supercross. It's like NASCAR, but without the money, and with more dust. Can a little Spanish buff that image and add prestige via a Superprestigio of the Americas? We'll see in November.